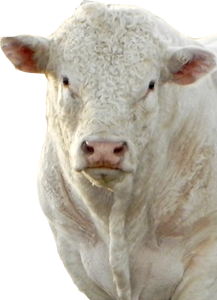 Come see us April 6, 2019 for our Annual Charolais Bull Sale! Each year our sale commences on the first Saturday in April at 11am near Great Falls, Montana at Western Livestock Auction (406 Vaughn South Frontage Rd, Great Falls, MT 59404). If you cannot attend the sale but would like to bid on our performance bulls, please contact us as our bulls will also be selling on TV and online via Superior Livestock Auctions. The bulls arrived in great shape. Thank you for sending us such a fine set of them. Your bulls are improving our herd in all aspects. By the way, we used two of your bulls on 42 virgin heifers last year and got along great. It is a pleasure doing business with you. DeBruycker cattle have the genetics for high quality meat, grading a strong percentage Choice with very little waste fat. With each year, DeBruycker cattle genetics become more in-demand and well-known by breeders, feeders and packers. Throughout the nation, there remains strong demand for calves out of Angus-based cows sired by DeBruycker Charolais bulls. We support our customers by aggressively bidding on/purchasing calves sired by our bulls. These DeBruycker-sired calves consistently top the video markets and auction sales in weight and price. We have an exemplary service record for dealing with customers. Your satisfaction is our success.